What is considered in my mind when “friends” are being discussed, are those that are my “best” friends, of which I’ve had very few. My very best friend from childhood is one individual that at one time would have done anything for me – I’d echo that today, but that friendship is strained because of a series of events which are unfortunate. Today, I’ve several friendship-relationships (which is what I call them in the place of “friendship”) that fit this Series, one even who loves to sharpen me every time he gets the opportunity… Another who keeps up with me, even when she is down for the count – she calls, texts, messages, e-mails and calls my wife to make sure that I’m doing what I should be doing. I’ve got one who is a self prescribed Doctor – who through all of his “honk-splat, honk-splat” and hair management glue – he takes the time to keep up with me and wants to know things are going – he cares to know. These are real people who have become so important to me because of my Relationship with my Saviour – they are True Gifts from God the Father – otherwise, I would have never crossed their paths, nor they mine. 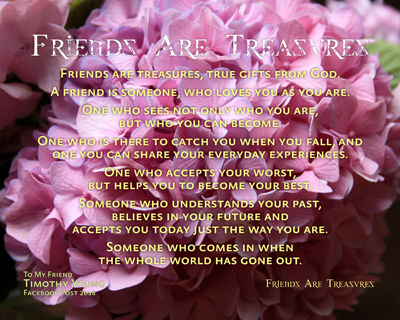 The following list of “Treasures” describes who “Friends” are and can be. It also is presented, in detail enough, so we’ll know how we can be Friends to others. Friends are treasures, true gifts from God. A friend is someone, who loves you as you are. One who sees not only who you are, but who you can become. One who is there to catch you when you fall, and one you can share your everyday experiences. One who accepts your worst, but helps you to become your best. Someone who understands your past, believes in your future and accepts you today just the way you are. Someone who comes in when the whole world has gone out. As I really took a look at this list, going past the “friend” defined as we’ve heard it so many times, the real meat of this began to build in my own heart and mind. Questions arose in me to review – am I the friend that is being described here?, do I love others that I call my friends like this?, who would I call the name of that knows me like no one else does, besides the Lord God of Heaven? Who am I being a friend to, which has NOT been built as to be a treasure, as to be a Gift from God? I have those that I “Treasure”, but who considers me to be so for them… This is known for fact: The very BEST friend we can have is our Lord and Saviour Jesus Christ! I’m going to keep on acting like, thinking like, loving like, being like the Lord Jesus – for that is where as much of my time as possible will be spent learning how to do so. Bro. Norris, Sis. Nancy, Bro. Steve & Bro. Jeff – all of you are Treasures to me – Gifts of High Value. But they that wait upon the LORD shall renew their strength; they shall mount up with wings as eagles; they shall run, and not be weary;and they shall walk, and not faint. Many think of having surgery, a major illness or a catastrophic event in their lives as reason to sit down, take load off and STOP everything. NO, NO, NO! If you have thought that, I’ve got some news for you Christian, that is NOT what the Bible says! Over and over again, we are give instruction through God’s Word as to what our actions, duties and heart should be doing – there are fourteen (14) passages in this first Series of two (2) that give us situation after situation where is was NOT a fun time for those suffering, but they waited on the LORD. Seasons and storms are going to come our way and enter into our lives at the most inopportune moments, which the world will find fault in some manner to discredit or in a vain attempt they will try as they might to pull the Lord Jesus off His Throne. This Series focuses on the Old Testament, as does the first passage come from Isaiah, which is a very solid foundation in which for us Spiritually to draw life’s lessons. This dear woman has taken the opportunity, through her physical struggle, to shine VERY brightly by way of showing us her personal walk with the Lord – what better witness can one have? Her husband travels extensively within the United States and has one of the SWEETEST testimonies about his wife for this time – sharing his appreciation, devotion and love for her everywhere he goes. Her heart and love for the Lord are always pointed to as being a strength to him – how many wives have that kind of an effect on their husbands? I’ve never met her, but to hear her husband talk of her, she is the best friend anyone could have and loves him beyond anything he’d ever believe one could. She Loves the Lord, depends on Him in, during and through her struggle, to support her husband – waiting upon the Lord. By spending time in the Word of God, we have the opportunity as Christians to find God’s Mind on the daily places where we find ourselves and the struggles we discover are upon us. We should be Encouraged to find that our Heavenly Father has MUCH to say about those places we find ourselves and those struggles we discover are upon us. Waiting can be difficult, especially when it involves a physical, medical or emotional challenges. We MUST remember that we have full access to the Great Physician as Christians, the One who can do something about everything. There is purpose in each time of challenge we have – something to learn, things to change and hearts to be molded. We may question at times whether or not that time is worth the challenge, but most of the time when we turn back and honestly consider God’s Plan – we’ll see He knew what He was doing all along. 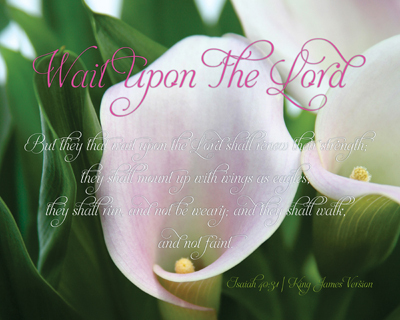 Are we willing to wait, all the while letting Him mold us and staying ready, when He says go? The cry of my heart is to be just that – letting Him mold me and being EVER ready to do, while staying right close to Him in all things I do. A lesson learned from a lady who has impacted me because of her love for her Saviour and her husband – Thanks Ms. Beth!! !